Power Lacing!! Love Power Lacing!! 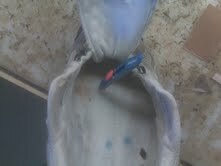 One of the greatest modifications for a tie-on shoe is Power Lacing. See the Video Below and the link below to get a real handle on it. It can greatly improve your foot and ankle stability. This starts a series of posts on Top 5 Home Treatments of various ailments. I hope this series is helpful to many patients. Previous posts may contain information on ordering, etc. See the backlinks below. Overal Improvement in Tone/Function fo the Lower Extremity through Pilates, Physical Therapy, Yoga, and other disciplines that can change gait patterns. Here is a scene from the 2007 San Francisco Marathon. If you want to get good at gait evaluation or just some exposure, do what all podiatry students are taught in their first day of biomechanics class. Go out and watch people walk in the malls, on the streets, in races like this and you can get a feeling of what is smooth and gentle on the body, and what is not. When I am treating my patients, I am trying to see what conditions make them stable and fluid in their motions. This allows for alot of experimentation at times with many different factors. When treating patients I have learned that you are rarely wrong by making recommendations that will make someone more stable. The runner in the photo above is so stable. That stability is seen in the solid foot plant, the centered knees and hips, the erect posture, the solid head position, and the power implied by the arm swing. To get patients to this position may take alittle or alot of work. Motion Control or Stability shoes and corrective orthotic devices may be necessary to get great foot position (see previous post). Knee, hip, and core strengthening may be needed for 3 to 12 months to keep the knees centered. To improve arm and trunk positioning, personal training may be important. Everything is geared for greater and greater stability, and with that stability, comes greater and greater strength. Always ask (whether you are the health care provider or patient)---How can I make the body work better that may help this problem and help prevent future problems? I implore health care providers and patients to expand your knowledge base in each of these areas. As your knowledge increases, so will the successes of your treatments or your care. From a lay person's perspective, when troubled by an ailment, always look for 2 or 3 layers of cause. Our health care is more and more becoming problem focused alone. This means that you go to a doctor with a sore knee, and your knee will be examined (but nothing else). This is a time problem physicians face, so work with them by asking smart questions. Go after the cause of why the knee was injured in the first place. Even when the primary cause is obvious, always look for other causes or contributing factors. One bit of wisdom I love to share is that it is common to have 3 , 4, or 5 factors causing an injury to occur. So I try to at least look for 3 possible causes and work from there at the first visit. I will give an example of this at the end of this point. Remember, pronation alone will not injure your knee. You need to look at what causes your knee to be the weak link? The next 95 of the 100 guidelines will improve your ability to recognize possible strategies if your treatment is not improving. If you use a lift for a short leg, or have a short leg, I will explore this area. If you have had shock absorption issues developing stress fractures, having osteopenia or osteoporosis, pound when you walk, I will explore this. If you have forefoot abnormalities sometimes diagnosed by bunions, hammertoes, metatarsal calluses, or pain in the front of your foot, I will explore this. If you over supinate, roll your heel outward as if spraining your ankle, break your shoes down to the outside, have hip or low back pain, chronic ankle sprains, tailors bunions (5th metatarsal), I will explore this. And if you over pronate, I will explore all the methods available to help you avoid the 33+ injuries associated. You see a health care provider for advice. The health care provider works in 3 areas all at once. All in all this normally works splendidly, but occasionally problems occur in one, two, or all 3 of those areas. It is difficult to identify the problem, so xrays, injections, MRIs, bone scans, ultrasounds, and surgeries may be performed. Several causes or aggravated factors initially not considered need to be identified and treated. Various treatments lead to aggravation of symptoms, or no help, and other avenues of treatment need to be explored. Some of the big name injuries, which have been studied the most because of their frequency, have had many causes identified some common and some rare. The dilemma for your health care provider is that scientific method does not allow treatment of all these causes at once, because it success or aggravation occurred, you would not know what was the cause. So most providers methodically work with one at a time. For the patient's prospective, this is a too lengthy process, and it can take forever to address the true cause of the problem. This is why I normally throw caution into the wind and try to deal with 3 areas at a time. Before I close, let us take look at Achilles tendinitis. There are numerous causes including tightness, weakness, technique faults, poor shoe selection, short leg, over pronation, etc. When I see a patient with this, I try to quickly check out leg length issues, tightness issues, and weakness issue. There I am dealing with 3 possible causes at once, and after several months, if the patient is feeling better, I look good. Hope this helps. There is a whole range of treatment options available for any injury or pain syndrome. It is important to match the seriousness of the injury with the complexity of the treatment, but that is where the art of medicine plays a vital role. Protocol based medicine, or I call it check list medicine, can be too black and white. The bunion on this patient's right foot may not be given all the options available. The art of medicine is in the nuances and subtleties. In general, I believe most injuries should be treated from simple to complicated based on how the patient does. If simple is working, why change it? Are you doing the patient any harm by not doing something else? Yet this requires followup and decision making at multiple points during the treatment. Following protocols, whether appropriate or not for that individual patient, is easy and efficient and less brain power needed to implement. Let us all, doctors/therapists/patients, think more. Our bodies are too important. This blog is all about empowering the patient to understand the treatments available to them and how to think through the process from sickness to health. The two photos presented here actually present a common scenario I see in a podiatry practice. 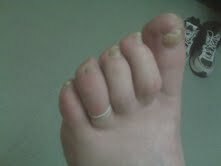 Two patients present to my office with the same problem---a painful bunion on their right foot that they do not like. Then, 6 months of treatment occurred leading to 2 results--first patient relatively happy with a conservative bunion program (see post below), and the second patient relatively happy with a new reconstructed foot by my partner Dr Remy Ardizzone (a subtle advertisement for her). 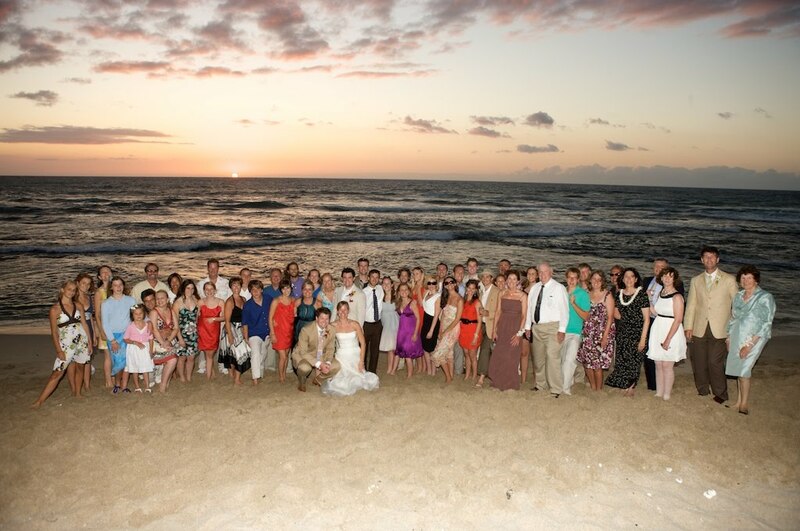 There were no protocols other than I move from simple to complex based on the patient feedback and preferences. I find some patients are only presented more simple approaches to a problem and some patients are only presented with surgical solutions to their problems (definitely more complex). The second part of this is that each aspect of a treatment has many complexities normally ranging from simple approaches to more complex approaches. Surgery on this bunion could have been done many ways, but in this instance my partner close a more complicated approach since this is what she felt was necessary. If you look at any treatment modality, there is an extremely wide range of options covering the spectrum of simple to complex. Orthotic devices range from very simple to very complex, treatment of short legs varies from heel lifts to shoe lifts, strengthening exercises range from simple range of motion exercises to complicated functional multi-directional tasks supervised by a trainor or therapist, and so on and so on. Along the course of treatment each aspect of treatment must be evaluated and decide if the treatment level is appropriate for the injury at that point. Is it the right orthotic device? Are the strengthening exercises the right ones, or do they need to need tougher or easier, or work on a different part of strengthening (more power, more endurance, more eccentric firing, etc.)? Are the anti-inflammatory measures appropriate for right now, or do they need to be changed? And on and on. This series of blog posts dealing with 100 principles of careful treatment hopefully will help you and your family and friends to be part of the team dedicated to your health by active participation in all aspects of the treatment. When I saw you last week, we talked about using the Budin Splint, and I am getting some minor relief, but I suspect it will take some time. 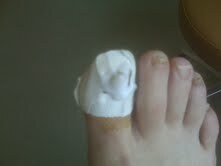 As you will remember I’m having pain on the third toe/metatarsal. Currently I’m using the Budin splint on that toe. But you also had them give me a double splint to use on the 2nd and 4th digits. I’m unsure as to when to use that – in place of the single budin splint eventually or alternating between the two? Also see one of the original posts on this subject. Here is another musical gift from Kapena from the Aloha Musical Festival near Waikiki Beach Sept 2010 singing Danny's Song. Multiple injuries are caused by each of the 4 major bio mechanical faults listed in the last post. They are over pronation, over supination, poor shock absorption, and leg length discrepancies. I will use one example of each to begin this discussion, but please realize the 33+ injuries have been shown to be related to over pronation, 17+ injuries related to over supination, and 10+ injuries each related to poor shock absorption and leg length discrepancies. With over pronation, the heel twists from under the tibia called heel valgus or heel eversion, leading to an abnormal twist on the Achilles tendon with each step, leading to Achilles tendinitis. With over supination, the heel rolls outward like in an ankle sprain causing the peroneal tendons on the outside of the foot, ankle, and leg to overwork to stabilize and prevent ankle sprains, leading to peroneal tendinitis. With poor shock absorption, the foot and ankle do not perform their normal functions to reduce up to 1 to 2 times body weight at impact during walking, and 2 to 5 times body weight at impact during running, and the shock wave can jar the tibia leading to tibial stress fractures. With leg length discrepancies, one leg is longer leading to constant overwork of the muscles and tendons to right (center) the spine to keep the eyes looking straight ahead. The Achilles tendon on the short side can help with the compensation by lifting the heel more, but over time the Achilles tendon develops tendinitis. So why does one patient with over pronation develop Achilles tendinitis and another plantar fasciitis or knee pain? Why does one patient with over supination (also called under pronation) develop peroneal tendinitis and another ilio tibial band tendinitis or low back pain? Why does one patient with poor shock absorption develop tibial stress fractures and another arthritis in their knees and hips? And why does one patient with a short leg develop Achilles tendinitis and another hip or low back pain? Athletes probably teach us the most about this topic since they ignore pain (No Pain No Gain Philosophy) the best. See my previous post on Personality Types. By the time they come into my office, they may have 3 or 4 injuries or sore areas at least going on all at once. 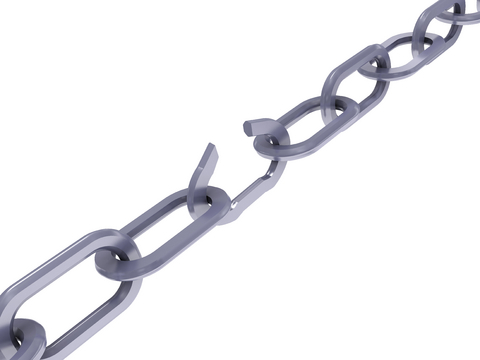 The health care provider needs to determine what came first (the weakest link), and what developed as the 2nd or 3rd weak links, or merely due to compensations (favoring or limping or protecting with various muscle groups. Definitely, if I was the supreme ruler of the universe (as I sometimes am on the basketball court!! ), I would have patients come in with only 1 injury at a time. At least I can day dream as I sit here waiting for jury duty to begin. Ask any ballet dancer if they are dominant on their right or left side because they are right handed or left handed and they will say no!!! They spend their whole careers fighting any dominance of strength and coordination from being right or left handed. But for most of us, we use one side of our bodies alot better, stronger, gracefully, than the other side. I am right handed and I have long played basketball as if I have no left hand--pretty gruesome sight to behold at times!! If you are right handed, your right side is your movement side (the side you kick the ball with), and your left side is your support side (the one you plant for stability before you kick the ball). And vice verse if you are left handed. And there are shades of this that I see in patients, and myself, from very dominant handed to almost ambidextrous. So a very common pattern of problems I see concerns the instability (weakness) on the support side. This can be very dangerous and slows down or speeds up rehabilitation. For an example, let us take a left ankle sprain in a right handed patient. The injury is to their support leg. The leg they support with is technically unsupportive. And this dramatically slows down rehab. The more dominant they are to their right side, and the more they relie on the left side for support, the more a left sided ankle sprain is disabling. Patients also hate to make their movement leg into their support leg. It feels so unnatural to them. So, it is much better for a right handed patient to sprain their right ankle, they seem to heal from and handle this injury better. When a right handed patient sprains their left ankle, they must regain that stability as quickly as possible with boots, braces, casts, taping and strengthening exercises. When a right handed patient sprains their right ankle, the goal is protecting it, but emphasizing getting motion back fast. 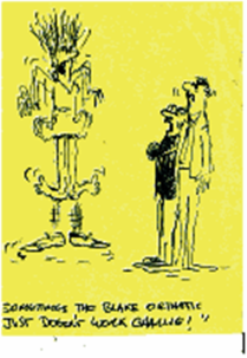 I hope this explains a common problem seen in a podiatry practice when an injury occurs to one side. I like to ask if they are right or left handed to make some correlation with the movement side vs the support side. I have seen many variations of problems created with this phenomenon. Recognizing this syndrome can help in subtle ways patients recover sooner. I need to spend some time in another post discussing Good Leg Bad Leg Syndrome which ties into this syndrome of Right Hand/Left Hand Dominance. I have come to see you in the past at the Sports Center for an ankle sprain. I have a question unrelated to the sprain and would like your advise. When I sprained my ankle I was training for my first half marathon. I started to get a callus on the ball of my left foot and that has now developed a corn on top of it. At first it would not bother me too much but as I continued to train it got worse and worse. Now after my training is over and, I admit, wearing not cushioned enough shoes it has gotten MUCH worse and has become very painful. For the past four weeks I have tried self medicating it with those pad treatments from the drugstore. I think Ive tried them all at this point, the Dr Scholls brands, and it is still there and still painful. Now even with no pressure on it, there is still a lingering pain. Is there anything else I could do/try myself or is it time to come in? Dear Jessica, Thanks for your email. Usually calluses and corns only become painful when they have grown too deep into your foot and are now irritating the soft tissue under the skin. It is the corn on top of the callus which is usually the most painful and bores deep into the skin, normally called "seed corns". As the picture above notes, these calluses can be like "gluing rocks to your foot", and can be multi-layered with variable depths with each layer. The hardness of the corn irritates the soft tissue under the skin which contains a rich supply of nerves. You can get a deep blister, very painful, underneath the callus, and so deep that it is difficult to reduce. But the blister part is irritated with massage, even gentle massage with a pumice stone. It is best to approach these very sore calluses with softening creams (ask the pharmacist for a great hydrator) three times a day, avoid skin irritants like the Dr Scholl's plasters with acid, lay the sore area on an reusable ice pack 15 minutes 3 times daily to reduce soft tissue swelling, try 1 session of 30 minutes cool water soak daily (the longer the better), and gentle removal with a callus scraper (like Ped-Egg) daily for 2-3 minutes to gradually reduce the callus. A trip to a Podiatrist would help make the diagnosis of callus, blister, or wart (since many of these painful calluses are actually warts under the callus), and speed up the callus removal by weeks since they can use very sharp instruments, plus place appropriate padding in your athletic shoes to off-weight the painful area. No matter what, the callus has become something else, since calluses do not hurt. It is how the skin around them reacts that produces the pain. Or is there a wart or deep blister needing other treatments. I would love to just make a comment about canes. They are used improperly from time to time and I hope this will help. Here my patient Albert is using his cane for a sore right hip. Albert is using it correctly in the hand of his strong side as the video below will note. Since Albert is right handed however, he has to fight the natural tendency to put the cane in his stronger right hand. It feels much better in the right hand of right handed patients, and left hand of left handed patients, no matter what side is injured. So when you see a friend or loved one with a cane, make sure it is in the proper hand for the injury they have. 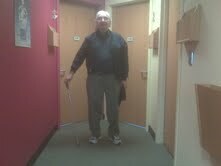 Here Albert is demonstrating the cane in the wrong hand for a right hip problem. 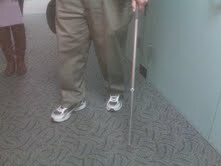 But he feels more confident with the cane on the right side, although wrong side. Since Albert was wearing a Giants hat, and they beat Phili tonight in the playoffs, how can I get mad at him. From the video below, you will learn that this cane is just alittle short also. Congratulations Giants!! 6 to 5 winners tonight over Philadelphia in the 4th Game of the national league championship series. We are rooting for you!! I came in earlier this summer and you prescribed me some more aggressive orthotics to deal with a knee issue stemming from cycling and a subtalar coalition. They have worked great, but if I am wearing non-supportive dress shoes I can get some real foot pain (same with the old orthotics, of course..that foot needs all the support it can get). I have a new job downtown so I will be walking about 1/2 a mile to work every day. Do you have any recommendations of dress shoe brands that are supportive for flat feet with subtalar issues like mine ? I figured if anyone would know, it would be you. Thank you, I definitely appreciate it! 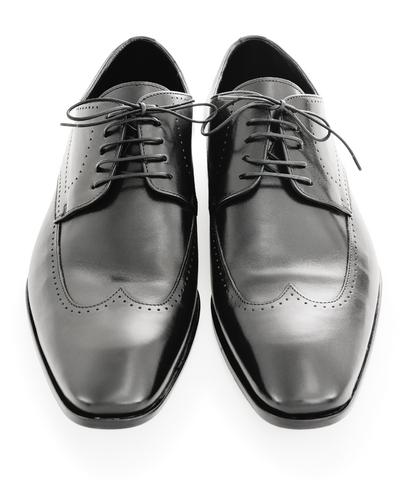 David, There has been a real explosion of good stable men's dress shoes which work with orthotic devices. See if Zappos.com has some of these. The list is only partial, but I hope a good starting place. There are some Cole Haan and Wrights Shoes that I would also put on, but seem too expensive to me. These shoes are in no particular order. Check out the video below on the sophisicated approach of top shoe manufacturers to fitting of orthotic devices. I only mean this for alittle fun!! Blog Stats: 5,007 Visits, 3,606 Visitors, 89 Countries, 36 Followers Thank You!! When toenails are very thick from fungus (called onychomycosis), or from trauma, or both, Carmol 40 Urea Occlusion Treatment can be a quick and easy way to take off the unwanted diseased nail without shots, or bleeding. Here athletic tape is cut into small pieces and applied around the nail to protect the surrounding skin. Only the nail should be exposed in the hole created. Benzoin, a skin adherent, is used on the surrounding skin before the tape is applied to further the chances that the tape will stay on for the entire treatment of 1 week. The patient is given an RX for 3 grams of Carmol 40 Urea Ointment to bring to the appointment. Here the medication is being applied to the nail in one big glop!! Once the medication is applied, more tape is applied over the medication in an attempt to keep it secure, and then the thumb or fingers of a glove (unsterile) is placed over the the entire toe. This creates a warm sweaty environment for the medication to penetrate the nail. 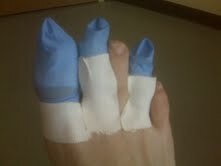 Here I am treating 3 toes on one foot and athletic tape is used to further secure the glove finger in place. Patients are especially advised to careful when removing their socks. 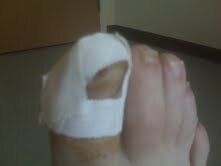 Is there a Funny Toe Photo Award on the Internet?? When the patients come in for their 1 week appointment, the bandages are removed, the toe nail clippers are used to remove all or most of the old diseased nail. The treatment does not remove good nail which is firmer in its attachment to the nail bed. This then starts a year of nail treatments outlined in the two posts below to get good and healthy nails if possible. Again, if the root cells are damaged, the nail will never be perfect, but they always look better. My name is Elizabeth and I am an editor for my school newspaper. 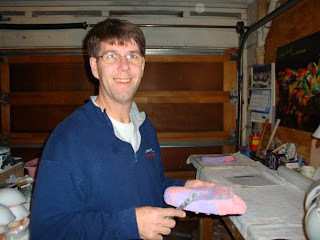 I would love your help in answering a short interview for a story I am writing on the shoes called Vibram FiveFingers. Thank you for the help, and I have included the questions below. 1. What is your full name and title at your health center? 2. Have you heard of Vibram FiveFingers? 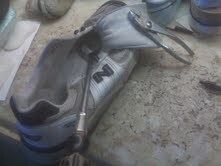 I've heard that these shoes strengthen the muscles and tendons in the foot. Is this true and why? 3. Are the Vibram FiveFingers better than a regular running shoe, considering support and weight? 4. Would you recommend these shoes for a young athlete? 5. Do you think humans have evolved so far as that shoes with this little "substance" would be unhealthy to wear? Sure, and good luck with the article. I am answering this also on my blog tonight. Thanks for the questions. Yes, by separating each toe they help the toes move better, thus allow the muscles and tendons into those toes work more. The more tendons move, the more strength they can gain. Regular running shoes provide more stability and more shock absorption for running. 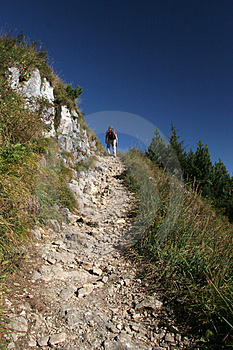 The faster you run, the body needs to absorb upwards of 5 to 10 times body weight, especially down hills. I would want the most protection I could get. The hype with these shoes is that it strengthens your foot and leg muscles and tendons while you run, but there are many better ways to safely strengthen feet and ankles, without the increased risk of injury. 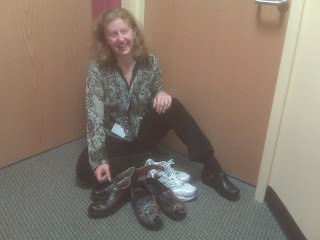 I have had thousands of patients in the last 30 years that were wearing unstable shoes for them and got injured. When we switched these patients to more stable shoes, their injuries got better. Athletic shoes have gone through cycles in those 30 years from more supportive, to less supportive, to more supportive, and now back to a run on less supportive shoes. Only time will tell us what injuries we will be facing. As you watch the video below, I am impressed by the break in part that is mentioned, but the running community must be intelligent about how this type of shoe is worn, how it is broken in, what type of warning on the label should exist, etc, to protect the consummer. I would assume that the younger the athlete, and the more immature the skeletal system is, the more protection it needs if it runs long distances. The foot does not become structurally sound until 18 to 20, and even 22 in slow developers. I would therefore be cautious with young athletes. After examining thousands of feet, there is 20-30% of all feet I would consider weak feet, very injury prone. Can anyone tell that patient, even recognize who they are, to intelligently steer them away from this type of shoe in the first place? I just don't see that sophisication in the running shoe stores. I therefore would be very cautious about these shoes for athletics. There is a little less protection for our toes, and toe injuries can be very serious. And there is a little less protection for the rest of the foot as well. Wearing this shoe will make our feet, ankles, knees, and hip move differently than what they are use to possibly setting up potential injuries. The body does need time to adapt to different environments. Being in sports medicine, I see so many injuries with the ultra light weight shoes for long distance training, that I worry that these shoes will produce many serious injuries because people won't know when to wear them. That being said if you gradually begin to wear them on stable surfaces with short runs and listen to your body never running through pain, it is probably fine. I love the idea that you should walk around in these for 30 hours before ever running with them. You would start with 1 hour the first day, adding 15 more minutes per day, until you were up to 30 hours. Then, when you start running, run 1 mile the first time, adding 1/2 mile to each additional run up to 5 or 6 miles. With running you should run the shorter runs with the Vibram FiveFinger, and the longer runs in the traditional shoes. This alternating of shoes prevents alot of injuries since the stresses put on your body is totally different with each shoe type. When you run with any shoe type day after day you can develop an overuse injury. Alternating shoes is a great way to reduce injuries. I am not sure about the evolution question, but I believe in general populations that wear shoes have weaker feet than unshod populations. 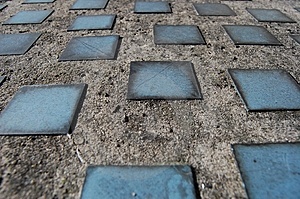 But, walking in the cement jungle we call home, I would strengthen my feet with exercises and take the protection shoes give me from the broken glass and sidewalk cracks out there. I hope this helps you Elizabeth. The video below at least emphasizes the break in process. PS I love these shoes for my bunion patients as a house slipper. The following are some key points in treatment. Do something every day to help and change the environment the fungus lives in. Develop daily, weekly, and monthly routines as the battle can take 1 or 2 years. Understand that if the root cells under the cuticle are damaged, the nail will never look right. Monthly disinfect your shower stall. Weekly put foot powder in the ends of the shoes you wear on a regular basis, removing all inserts from these shoes and let these air out over night. Weekly use a pumice stone or emery board, and file the tops of the nails to open up to air. Fungus lives in anaerobic environments. If your nails are real thick, you must keep them as thin as possible. I will have a post in the next few days on Carmol 40 Urea Occlusion Technique which is designed to remove all bad nail in these very thick nail situations. You can talk to your doctor about this technique. Daily apply tea tree oil, Vick's Vapor Rub, white vinegar, or one of thousands topical anti-fungal creams/lotions. This should be done twice daily. 2 or 3 times weekly use 2 cups of white vinegar in 2 cups of warm water (bigger amounts of the same ratio if needed) and soak your toes in a basin for 30 minutes. If you time it before you shower, you can get the salad dressing smell off. I am presently recommending laser treatments (work 50% of the time and expensive) before any consideration of oral medications like Lamisil. If you and your doctor are considering oral medications, try Lamisil pulsed. You can read about it in other posts within my blog. It is taken 7 days per month for 6 months. This is less likely to cause side effects over taking daily. However, Lamisil is not benign and can cause serious side effects. Have a long conversation with your prescribing doctor before taking. Sporonox, which used to be my go to drug for this, has been black labelled due to side effects such as this. If you have had enough of toenail fungus, and I do not blame you, try listening to Kapena from my recent Hawaiian trip. My gift to you. I have a great partner Dr Jane Denton whose patient this story belongs. Did you all see the movie entitled "Patch Adams", starring Robin Williams. For all those in the medical profession, it was very inspiring, and we all practiced medicine alitttle gentler and kinder after seeing it. Here is my partner Dr Denton, watching her patients walk down the hall, analyzing how each shoe functions, although perhaps not too many clown shoes. One day, a patient presents with severe pain in both of her feet. When asked how the pain developed, had she done anything different in her activities, the patient responded by saying she had just come back from vacation where she had worn very large clown shoes for about a month. The clown shoes were very big, and she was able to wear her normal shoes inside them, yet her feet moved around within the clown shoes, as she toured China. You see, this patient had also seen Patch Adams with Robin Williams, and discovered it was based on a real life person. The real Patch Adams continued to live life differently then some of us. So she looked him up, and found out he was leading a tour of 40 clowns through China visiting hospitals and orphanages. 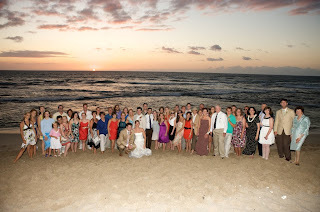 The trip was life changing, and the 2 months of foot pain was worth it without hesitation. See the link below, perhaps your life may be changed forever. Thank you Patch Adams!! What is being demonstrated is a small toe crest for pain at the tip of a crooked hammertoe. They come in left and right with the thickest part under the toe closest to the big toe. Here Albert's pain is on the end of his fourth toe. The elastic band should be relatively loose around the 4th toe filling in the under surface of the toe area called the "sulcus". To keep the elastic band on loosely, a piece of scotch or paper tape attaching the band to the skin on the top of the foot can hold the elastic band in place. 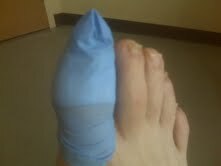 It should never feel like it is cutting off the circulation, or that the toe is throbbing. You can tell by the photos that it was perhaps too tight on Albert by the indentation it left on his skin. Here you can see the toe crest attached to the base of Albert's toe. His sore is at the tip of the 4th toe so the material lifts the tip off the ground slightly relieving the pressure. 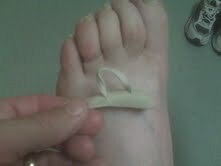 Due to Albert's foot size, I could also have used a medium and placed the band over the 3rd toe. 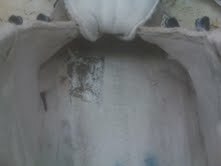 You just try to get some bulk of the material under the effected toe. Toe crests are "necessary evils" (one of my favorite sayings especially about casts) since they do not straighten hammertoes, but probably if worn for awhile, make the hammertoe curl more. 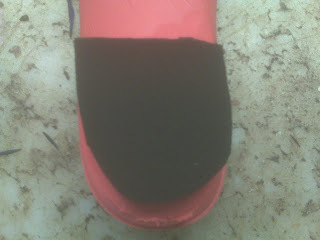 Another product I use is a foam toe cap designed initially for ballet dancers. It is more bulky than a toe crest, but does protect the toe, and produce a straightening effect on the toe. It is always a trade off with these various inserts. I have not found patients to like the gel version of these toe crests. Toe crests can be modified simply if they irritate you in a spot by cutting out an area and putting a small piece of tape over the area. Believe me, they do not bleed when you cut into them. I am a San Francisco Podiatrist and love my San Francisco Giants. If any fans are reading this and have not seen the incredible video by Ashkon, I know you will enjoy. Thank you Ashkon. I am a fan!! This new video is on achilles tendon/calf strengthening. With the achilles tendon being the strongest tendon in the body, this is a vital area to re-strengthen after injuries or prolonged inactivity. The reader is encouraged to read the previous post on strengthening exercise in the article on Treatment of Tendinitis (the link is below). Thera Band type strengthening used in this video is also called Progressive Resistive Exercises. You gradually work through a varying resistance based on the variable resistance placed in the multi-colored bands, but also the resistance is variable since it is coming from you. You supply the power to move the band which will resist you back. As the patient works from 2 sets of 10 reps in the lightest band to 2 sets of 25, usually add 5 more reps per week, they then move to the next color starting again at 2 sets of 10. Every advance should be pain free and feel easy to the patient. Strengthening at a low level can be done daily, and I prefer my patients to do them in the evening. In this way, if you fatigue the calf muscles and achilles tendon, they have all night to rest before you stress them the next day. Gradually, as you advance to the weight bearing gastrocemius and soleus strengthening exercises, you should switch to the normal strengthening regimen of three times per week. I can not emphasize enough how neglected the Soleus muscle is in achilles rehabilitation. These weight bearing achilles exercises are so important. All achilles injuries must be rehabilitated to be able to do 2 sets of 25 single leg gastroc, and 2 sets of 15 single leg soleus. Without restrengthening this vital muscle, reinjury will occur, and injury to surrounding muscle/tendons with various tendinitis will occur. Physical Therapists these days love the Weight Bearing exercises demonstrated since it is Functional. But the resistance bands can play a big role in regaining lost tone in the gastroc and soleus. It has been said that the gastroc and soleus lose 3-5% of their strength per day in an injury, and gain it back less then 1% per day. Do the math to see how long it may take you to regain achilles strength if you are injured and need to be in a cast for 3 months. Good luck with your Rehab!! You were recommended to me by Dr, Pribut, In Washington DC. I live in Santa Barbara. I recently injured my ankle. It is very serious, Lots of pain, swelling, etc. I did a classic roll of the ankle coming down from about 4 feet in height off of a rock climbing move. I heard a loud pop at the time of the trauma. The Orthopedic I saw at my local clinic diagnosed it as an anterior inferior tibio-fibular ligament tear. He also said, “probably other ligaments have torn too”. I am 50 and have had many ankle sprains in my life, the Orthopedic took x-rays and said my history of multiple injuries probably prevented it from breaking. He did not see any fractures. He went quickly to a diagnosis and put on a removable cast, ordered physical therapy and told me he didn’t need to see me again, but to follow the instructions of the physical Therapist. He also said this injury could take 2-3 months to heal. I have been experiencing ankle pain for some years and in the x-rays, there is a lot of indication of arthritis tissue. Having a proper healing is extremely important to me and I would gladly get myself in to see you if you were available for an appointment. Dr. Pribut recommended a second opinion and I’m worried the local clinician may have rushed through it. I can have the x-rays sent to your office if necessary. Can you offer some input? I am honored that Dr Stephen Pribut recommended me. For all of my readers, you should definitely check out Dr Pribut's informative website. 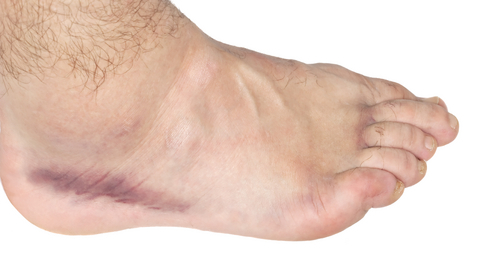 Athletes come into the office all the time with their "worst" ankle sprain. When they tell me that they have had multiple sprains, I always ask where the most current one fits into the range of severity with the other ones. Is this your worse one on this side of your body? If they answer yes, red lights should be flashing. This may be more than an ankle sprain. After the first sprain, with the ligaments torn or stretched, the ankle joint has the ability now to go further, rattling the bones around under the skin, and possibly causing more damage. With any ankle sprain, there is the risk of chip fractures, cartilage injury, and tendon injury. This is along with the definition of a sprain: an overstretching (grade 1 sprain), a partial tearing (grade 2 sprain), or a complete tear of the ligament(s) (grade 3 sprain). By the sound of your description, you have more severe damage until proven otherwise. You need an MRI to identify what has been injured exactly, so that the exact treatment can be outlined if possible. You have a better chance of healing properly if we know what is wrong. It is so common to bruise the cartilage in your ankle with a sprain like this, and that can take 2 or 3 years to mend if at all. Of course, this is the worst case, but if this is you, please show this to your family doc and get an MRI of the ankle ordered. With a bad ankle sprain, just going to physical therapy, if you have cartilage damage could make you worse. The physical therapist will treat the diagnosis of an ankle sprain, not a fracture or cartilage problem. The therapist can only go off of the perscription. PS If you start PT, avoid sharp pain. Read the post on Good Pain vs Bad Pain and follow it closely. This is a pictorial view of the process used when orthotic modifications have not been enough to take away pressure from a sore area at the bottom of the foot. In this case with Sidney, his right big toe joint is very sore and needs this softness placed into the midsole of the shoe to off-weight the area. Any weight bearing areas can be modified in an athletic shoe like this to take stress off the painful spot. The hole created is normally 1/2" to 1" in depth. The extra padding is as soft as the cobbler/pedorthist/podiatrist can find. 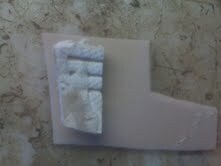 Here a scapel is used to carve out the initial square/rectangle area. Care is taken not to go all the way to the side of the shoe disrupting the stitches between the upper and midsole, and care is taken not to cut through the bottom of the shoe. After the initial cuts, a flat screw driver is used to prey up the piece needing removal. Here the section to be removed is demonstrated in a closer view. Here the hole created is demonstrated and can be filled with a number of soft materials. Here the soft material I will use is being measured against the piece removed. Depending on the thicknesses of material, you may need more than one piece of padding to completely fill the hole. And the final product!! But not as beautiful as the Giants come from behind victory today against the Braves. Vitals: 4,418 visits, 3,181 visitors, 86 countries, 34 followers Thank You!! I saw found your name through yelp, and I have been very impressed by your reviews. 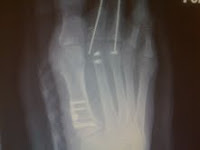 I wanted to get your opinion about surgical excision of an accessory navicular bone. I'm a 27 year old male who is active with running and triathlons, and I'm also on my feet all day at work. I went in to my podiatrist with a complaint of pain at a bump on my medial arch that has been on and off for the past year. X-rays showed a rather large accessory navicular bone, and my podiatrist recommended removal of the bone and tacking down the posterior tibialis tendon to the true navicular. My pain level varies between 0 to 3 out of 10, and tends to flare up after running 3-4 miles or standing for 10+ hours. I have been forced to cut back on my running significantly as a result. I was wondering what your experience and opinion is about surgical removal of an accessory navicular bone? Are there conservative measures that you feel may be successful? Or is surgery the best option? Thank you, I appreciate you taking the time to read my email! Thanks for the email. The accessory navicular is also called "the second ankle bone", on the side of the foot as the arch, and rarely needs surgical excision. 10% of the adult population has it, and 30% of those have it on both sides. Being a very common weakness in the arch, and seeing thousands of patients with them, I have seen only a few go on to surgical excision. The posterior tibial tendon, the strongest tendon to support the arch and stop pronation, attaches into this side of the navicular. When you have an accessory navicular, you have a weakened arch by definition, but not one that is needs surgery that often. The source of the pain can be in the tendon, in the attachment of the accessory navicular into the navicular, and in the ligament underneath. The source of pain must be identified before you trade your pain with a surgical scar. A surgical scar has 10% chance of bothering you as much or more as your present symptoms. I am seeing on one hand, the gradual development of better surgical instrumention, and on the other hand, a problem with post operative care (less physical therapy being covered is a great concern particularly). With all that being said, let us start at the beginning. Golden Rule of Foot: Find Out What It Takes to Make The Patient Painfree, and then how to keep it that way. Before considering surgery, you should be on a very gradual progessive posterior tibial strengthening program. It is very reasonable to make your tendon 3 or 4 times stronger than it is now by exercises that isolate that tendon. In your honor, I will dedicate several posts over the next few weeks on this topic. Please see the links below on generalizations of strengthening. You will probably have to work with a good physical therapist to review all of the exercises and analyze where you are now and set up a reasonable plan. But, this is very do able. The next vital piece of the puzzle is anti-inflammatory. If you have pain, constant in nature, even at a 1 or 2 level, you should be doing a 10 minute ice pack twice daily to cool down the soreness, whether it hurts or not. Never run through pain (see the link below on Good Pain vs Bad Pain). If the soreness has been more up into the 3, 4, 5, 6 levels consistently, then you should use more activity modification, more icing, physical therapy, and perhaps medications. The program should be for 2 weeks longer than it takes to get the pain to 0 to 2 levels. Once you are at that level, you need to figure out how to keep it there. What does it takes? Normally while patients are dealing with strength and anti-inflammation measures, they are also working with biomechanics (arch support) and testing to discover the source of pain. The two standard tests are MRI and bone scan, but CT scan may have a place. The MRI is the best to see tendon or ligament damage (which may need surgery, but should be initally casted). The bone scan is best if you have a bone problem that may respond to removable cast and bone stimulator. Oh, before I forget Jon, please copy a blow up photo of the accessary navicular (multiple views are encouraged) in the comment section or email to me, because it could give me more info. Getting the right orthotic devices can be hard (maximum support, but comfortable, is always a challenge), but it is vital to seeing first if surgery can be avoided, and second, helpful in the two years after surgery if needed that you have a weak arch. All the skills and understanding of principles you learn in this phase can be vital if surgery is indeed needed. Besides orthotic devices, arch taping (simple kinesio demonstrated in the photo above), power lacing (see link below), stable shoes, and training regimens, are all vital to keep you going. Jon, I hope this starts a journey of understanding so that if surgery is needed, you will have the best chance that it is successful. One of the beautiful Hawaiian sunsets I saw on my last vacation. When treating plantar fasciitis/heel pain with custom or off the shelf orthotic devices, remember that the orthotic device must transfer the weight into the arch and off weight the heel to be successful. If you imagine that the average person takes 6,000 to 10,000 steps per day, the importance of successfully transferring body weight forward and cushioning the heel seems obvious. Yet, I see this rule broken every day in practice. If you have orthotic devices, and you are experiencing heel pain (whether from plantar fasciits, heel spurs, heel bursitis, poor fat pads, pinched nerves, or heel bone stress fractures), this general rule must be followed. Talk to the health care provider whom is ordering, or has ordered the device, to see if this is their goal as well. Evaluate the orthotic devices when you have them to see how they feel. Have them modified if your symptoms are not improving, and you feel only a little pressure in your arch, or too much pressure on your heel, or both. 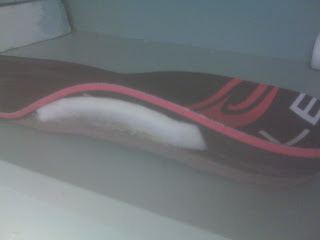 Here you can see how an OTC (over the counter) orthotic device from Sole (http://www.yoursole.com/) can be modified with greater arch support to achieve this higher degree of transfer of body weight. In this image the bottom of the orthotic device was first adjusted to decrease its rigidity in the heel (can even be done with plastic orthotics) and then soft Spenco (http://www.spenco.com/) used to further softer the heel area (normally done to the part against the foot). Guess who I am rooting for to go all the way. The rear foot post (also called extrinsic heel post) can be made out of soft material. The soft material, like birkocork shown here, will need to be replaced every 3 to 5 years, but gentler on the heel and knee/hip joints when the heel strikes the ground than the more durable plastic based posts. No top cover is better than the original Spenco (although a knockoff called neolon is shown here). Between the top cover and the plastic when there is heel pain, more Spenco or Poron can be used. Here is an example of a plastic post, placed on a plastic orthotic, and the right side is even worse with an additional plastic heel lift. 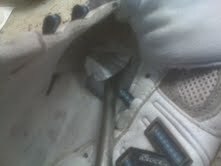 No wonder the heel kept hurting. Think soft heel and supportive arch for the best results. 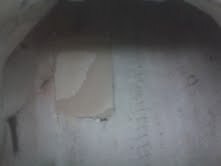 Adhesive backed gel sheets can now be used, normally 1/8", in the heel area, and then covered with Spenco to protect it. This is only for walking, but sure is cushy!! With sports, gel is too unstable a surface. You can order this from the link below. So, with plantar fasciits/heel pain, the success or failure of your conservative treatment may rest on the ability of your orthotic devices to soften the heel and transfer weight into the arch successfully. Good luck! !